Last year, I read Du côté de chez Swann (Swann’s Way), the first part of Marcel Proust’s seven-volume epic, À la recherche du temps perdu (In Search of Lost Time). It was my first encounter with Proust and his masterpiece, and it was certainly, ahem, an experience. For those of you who have never tried his work, it’s a fairly difficult job to describe how it reads. Simply put, this is not writing for those who enjoy plot-driven novels (or anyone who likes things to, well, actually happen over the course of a book). Part One – Man remembers his childhood in the country. Eats a cake and has flashbacks. Part Three – Long, seemingly irrelevant, story about a family friend’s love-life: am assured this will eventually become relevant. Of course, there is a lot more to À la recherche du temps perdu than that. The destination is of relatively little importance – it’s the journey which makes it a great book. Proust’s writing is unlike anything I had previously encountered, a mesmerising, minutely-descriptive avalanche of words (although ‘glacier’ might be a more fitting choice here) – phrase after phrase, sentence upon sentence, paragraph after paragraph, pages of hypnotic prose, drawing the helpless reader ever further into Marcel’s world. What begins as something akin to watching paint dry (and each time you pick up the book, this feeling is still there at the back of your mind), ends with the reader becoming completely absorbed with the text, forgetting the world outside, fascinated by… something which described in fewer words would probably not be that interesting. Je pleurais mais je trouvais le courage, je connaissais la douceur, de sacrifier le bonheur d’être auprès d’elle à la possibilité de lui paraître agréable un jour, un jour où, hélas! lui paraître agréable me serait indifférent. A more obstinate precocious arrogant younger version of myself worked my way through the many paths, & cul de sacs of Proust's book, although I was mightily impressed etc, not sure if I have the patience nowadays.. 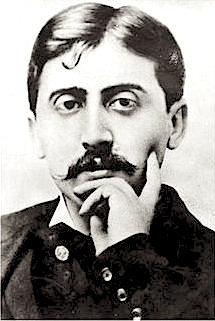 Wonderful post which captures much of Proust's style and method. The contrast between what you (the reader) thinks about Marcel and his treatment by others is one of the things that often struck me through my reading of it. The Magic Mountain is really wonderful, too, although as with Proust I read it in translation. It's due a reread but there are just so many unready on my shelves. By far the best writing I have ever read in my life. Keep at it, don't give up because it gets better and better as you go along. If you've had Aha! moments already, wait till you get to le temps retrouvè. Nothing will ever read the same. Yes, at times it's long, and (I admit) boring, but DON'T GIVE UP. Despite the effort that needs to be given, I find it ultimately satisfying afterwards. I've only to read the final installment and I dare say the characters will grow on you and even stick, as they'll keep reappearing in more ways than one in the subsequent volumes. Margit – It can be a struggle, but I've found with my German reading that the more you try, the easier it becomes. As for 'Der Zauberberg', next year (maybe)! I agree with you, Marcel is not always likeable. Swann's Way is not my favourite volume. I understand perfectly your question about reading it in French or in English. I have the same problem with Henry James, only the other way round. I don't know exactly how good your French is. Proust is difficult for a native French speaker too. You know, Proust is extremely funny in a subtle way. He uses irony like an Englishman with a French background. My experience with reading in English is that when you need to concentrate too much on the language, you miss that kind of humour. The Scott Moncrieff translation is free on the kindle, why don't you try it in English? It would be a pity to miss the fun; Proust's humour is one of the best things of In Search of Lost Time. PS: There are good reviews from Max and Seamus on my Reading Proust page. It's good that you didn't miss the humour. It didn't show in your entry and with your last paragraph about reading it in French, I just wondered if you weren't missing something. I'm over half way through the third volume at the moment. In that you do get a definite sense that not everyone loves young Marcel. There are those who do, and who admire his wit, but others who quite clearly view him as a flatterer and perhaps even as a social climber. He also at times comes across as a bit of a stalker. The thing is, to his face everyone is charm personified, but everyone is charm personified to everyone to their face. It doesn't mean much in terms of what they actually think of each other. Marcel's inclusion in society often seems to be more a matter of favours done in recognition of his family, or just him having inveigled hismelf some form of invite, rather than a genuine desire to see him for his own sake. You do have to surrender yourself to the text as you say. I think you're right in that. In the third volume I spent 150 pages or so on a single salon party and much of the book dwells on issues of pro and anti-Dreyfus politics which can be quite hard now to follow. Still, the writing is staggeringly good, and there are moments of such insight that perseverance is more than rewarded. I absolutely intend to press on with the other volumes. I forgot to say, Proust is also frequently funny as hell. There's tremendous wit in these books. Emma's totally right about that, and it's the biggest and most welcome surprise in reading them. Max – That's good to hear – I really can't see (so far) why anyone would give him the time of day!